Aisha Al Zaabi brings us the heart wrenching story of ‘My Dear Home with Love’. Fatima, a young girl of about nine years of age sits in the back of her father’s truck, clutching on to her worn out teddy bear as her eyes scan the new, unfamiliar place searching for a zone of comfort. The dusty, desolate lands of Ras Al Khaimah added to the drab scenes that took over the movie. The audience gasped in anger as the young boys trashed Fatima’s only means to earn money and roughly kicked her bicycle around. Khalid’s and Fatima’s performance wowed the viewers as they taught us the meaning of new founded friendship and how much a home can mean to an individual. They showed us how two children barely of twelve years of age can support one another even when their views and backgrounds might seem miles apart. The lights turned on for a short period of time as voices from the audience arose, discussing the events of the movie. The projection of the first scene from the next movie- Violin appeared on the screen and the people in the room quieted down immediately. Berlin- the capital of Germany was the setting in the second movie. The scene opened up and the strumming of steel strings of the guitar played from the speakers. 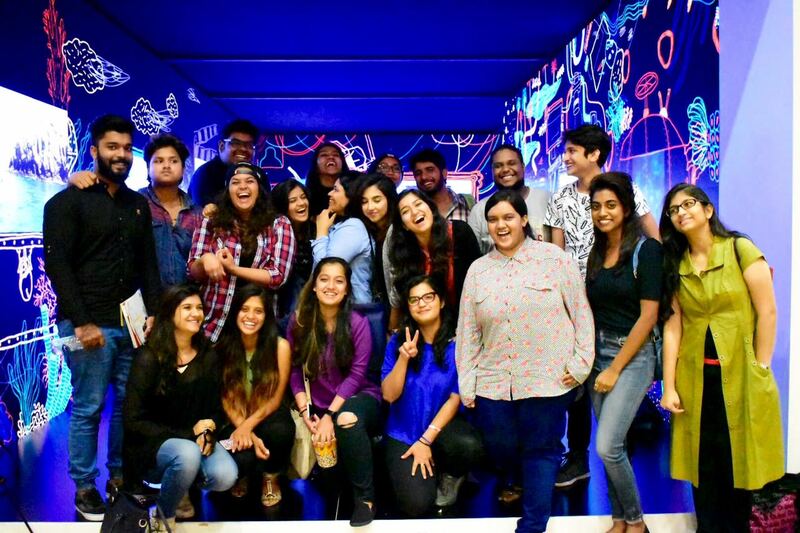 The students who were brought in by School of Media and Communication, Manipal Dubai grinned in content as a modern era took over the form of speech and streets of Berlin. Khalid, a character in the movie was renting a room in a ‘Haus’ (which is German for House). The sounds that were played on the violin gave the audience goose bumps as an aura of something paranormal took over. Towards the end we see that religious beliefs differ from those of inter-cultural belief. It showed us that one must not combine inner conflict with cultural belief. There was a brief Question and Answer session held in Arabic as the professors gathered around the directors and actor in an informal interview. The audience trooped out as they walked off in different directions as the students gathered around food stalls. The clicking of cameras and quick insect-like movements of the photographers sounded in the vicinity. The lights from above were dull and casted a yellow pale glow over everyone’s faces. There were students gathered in the Neon Pathway on which the walls were illuminated by drawings made by children. There were different photography studios out of which one was a Stop Motion Photography Studio. The students from School of Media and Communication trailed out into the open air happy with the events of the day as they climbed into their buses. On behalf of the students of SOMC Manipal; a big thanks to Sharjah Children’s Film Festival (SCIFF) for giving them the opportunity to experience this event.